And for sure, Obama struck me in his speech as a powerful, fair, and keenly observant leader, one who is listening to us the people. I can hear in his words that he grasps where we stand in the context of present circumstances, as well as in history. This is such a breath of fresh air, I can hardly believe it. 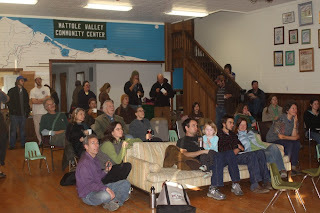 We gathered with about 30 or so people at the Mattole Valley Community Center this morning, over a breakfast potluck consisting of a yummy array of muffins, coffee cake, fruit, and coffee, to view the swearing in ceremony and Inaugural Address. We laughed and cried and clapped, and left uplifted. I couldn't help but feeling inspired, knowing that all across America today, people were celebrating and feeling excited. That feeling of hope is powerful, and calls us to something higher than ourselves. At last, we are here, and we wave a hallelujah farewell to GW. Below are my favorite excerpts from Obama's speech. You can read the entire transcript here. "On this day, we gather because we have chosen hope over fear, unity of purpose over conflict and discord..."
"...Now, there are some who question the scale of our ambitions, who suggest that our system cannot tolerate too many big plans. Their memories are short, for they have forgotten what this country has already done, what free men and women can achieve when imagination is joined to common purpose and necessity to courage. What the cynics fail to understand is that the ground has shifted beneath them, that the stale political arguments that have consumed us for so long, no longer apply..."
"As for our common defense, we reject as false the choice between our safety and our ideals..."
"Those ideals still light the world, and we will not give them up for expedience's sake. "... our power alone cannot protect us, nor does it entitle us to do as we please. Instead, [the founding fathers] knew that our power grows through its prudent use. Our security emanates from the justness of our cause; the force of our example; the tempering qualities of humility and restraint." "And to those nations like ours that enjoy relative plenty, we say we can no longer afford indifference to the suffering outside our borders, nor can we consume the world's resources without regard to effect. For the world has changed, and we must change with it."